Taiki-Shisei-kenpou was founded by Master Kenichi Sawai, who was the only foreigner to learn YIQUAN(DACHENGQUAN), from its founder Master Wang Xiangzhai in China. Therefore, Taiki-ken is the almost the same as YIQUAN. Among many Chinese kung-fu styles which emphasize their stereotyped patterns, Taiki-ken puts priority on real fighting. From its strength based on the real fighting, Taiki-ken is regarded as one of the strongest real-fighting Chinese kung-fu styles by a lot of Japanese martial artists. Taiki-ken has fascinated many athletes. Some of them came to Master Sawai to learn Taiki-ken. Through this background, Taiki-ken has influenced various martial arts, including Kyokushin karate. Wang Xiangzhai, the founder of DACHENGQUAN（YIQUAN）, learned xingyiquan from Master Guo Yunshen(Kuo Yun Shen). 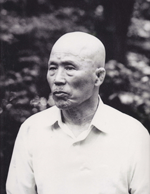 Guo Yunshen was the master of xingyiquan. People talked about Guo's fighting style and his strength, "Half-step toward an opponent and punch. That's it." Guo found Wang had splendid talent and ordered him to practice "Ritsuzen" (standing zen: training without motion)thoroughly. Also, Wang realized that the origin of Guo's strength came from this special training "Ritsuzen". After Guo died, Wang took many matches with a large variety of martial artists'. Through these matches, Wang was making up his own style, abstracting essences from thousands of Chinese kung-fus. Because of its strength and essence-abstraction, people called his style DACHENGQUAN, which means integrating a large variety of Chinese kung-fu's styles into one style. Also, he trained many disciples until they became full-fledged athletes. At the same time, Wang was always studying to enhance his skill, observing the movements of many animals to improve his movement more efficiently and reading a large variety of books about martial arts, including Japanese Jyudo and Kendo. 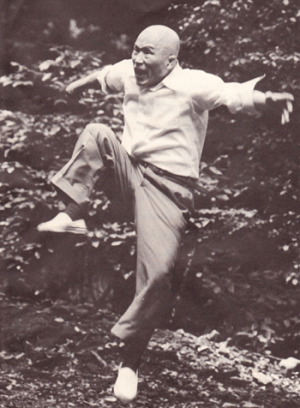 Even Master Kenich Sawai, the founder of Taiki-ken, was surprised by Wang's enthusiasm for learning. Furthermore, Sawai attacked Wang with a stick used for Japanese Iaido. The result was the same as before. After defeating Sawai, Wang told him quietly "Either a sword or a stick is just an extension of the hands." Sawai was completely defeated and so shocked that he could not eat anything. After considering, he, at age 36, decided to learn YIQUAN from Wang. Initially, Sawai learned YIQUAN from one of Wang's disciples, Master Yao Zongxun, who would be the formal successor of Wang later. Through training for a few years, Sawai's skill had developed very much and he was promoted to learn from Master Wang directly not only in the gym but also in the garden of Wang's house. Sawai was the only foreigner who was learning YIQUAN under Wang. In additon to his fast enhancement of YIQUAN's skill, Mr. Sawai's special skills of Japanese Iaido and Judo made him receive special attention from Master Wang. Some books, magazines and so on say Sawai learned only from Yao Zongxun, never from wang. However, it is mistaken information.According to the magazine, the writer was a disciple of Han Xingyuan, who was a disciple of Wang, and has interviewed a lot of Wang's disciples) , Sawai , in those days, was more courteous than anyone else. Every month Sawai took a present , such as wheat, rice, dried meat and so on, to Wang. It was an age of shortages, so Wang could still live a good life. So Wang was delighted and he taught Sawai Yiquan directly. (In fact, Wang often taught his favored disciples Yiquan in the garden of his house. Yasuhide Takagi also often heard , from Sawai, about Sawai's training with master Wang and Wang's strength. One of them is"It was hard to believe that a human could reach his level of power."). The reason why there was such a mistake is the fact that Sawai often took his friends, who were confident of their own strength, to see Wang. One of them was Masao Watanabe who was familiar with boxing and was Sawai's subordinate. He learned a lot of Yiquan from Yao Zongxun. So, it was not Sawai but Masao Watanabe that Yao Zongxun taught a lot. (When it came to boxing, later Yao absorbed boxing into Yiquan because he was influenced by these techincal exchanges with Masao Watanabe.) The above-mentioned items were related by Seiji Satou who is the only Japanese who learned from Yao Zongxun. He has heard a lot of speeches by many of Wang's disciples in China. Ausust 15th 1945, 5 to 6 years had passed since Sawai started to learn YIQUAN, World War II had ended. He was shocked very much by the defeat of his mother country and was considering suicide with his family. At that time, Master Wang came to his house and dissuaded him from suicide. Master Wang insisted that Mr. Sawai should live and return to Japan, which was the best choice not only for Sawai but also for YIQUAN(DACHENGQUAN). After returning to Japan, Sawai practiced with Mr.Oyama Masutatsu, the founder of Kyokushin-karate, and also taught to Mr. Oyama's students. At the same time, Sawai separately started to teach YIQUAN to his own students in Zingu forest, located Shibuya-Tokyo, every Sunday. As qigong was not so popular like nowadays, his training methods representing Ritu-zen(standing zen)were very strange not only to observers but also to students. On the other hand, hardness of sparring, real fighting, was famous among Japanese martial aritists. Sawai himself, age 60s to 70s at that time, fought with many martial artists from outside, called "Dojo-Yaburi", and defeated them. His strength coming from swift movement during matches astonished watchers. (It was hard to believe that human can reach such level.) There are many martial artists who confessed that they were defeated by Sawai completely. Mr. Takagi Yasuhide, the head of Taiki-ken Shisei-jyuku, told; When I met Sawai-sensei (teacher) for the first time, he was near 80 years old. When I saw him fighting with other people, I felt that his movement was slow. However, when I fought with Sawai-sensei, his movement was so fast that my eyes could not catch up with it. Even if I noticed that the distance between Sawai-sensei and myself, "maai", was enough, I found, at the next moment, his face was just in front of my chest. I realized that I had no chance to defend myself from his attacks. It was his game. Also, Sawai-sensei's kick looked like that of a beginner of karate. full-fledged disciples, including Mr. Takagi, and is being practiced. -Publishment: Title "Taiki-Ken: The Essence of Kung-Fu"
Master Wang was the master of xingyiquan and realized that the strongness of his teacher,Master Guo, came from Ki(ch'i). Without Ki(ch'i), any techniques would not be materialized. Master Wang considered "Ritsuzen" an essential training, through which Ki(ch'i) can be enhanced. Centralizing "Ritsuzen" in his training, other training methods were being developed. Therefore, "Ritsuzen" is the most important training in YIQUAN and Taiki-ken. On the other hand, Ki(ch'i) we mentioned in the above is not the mysterious ESP which can be watched on TV but the ultimately enhanced reflexes. Many people liken the astonishing movement of Master Sawai to a shrimp's or a whirligig beetle's jumping, which is quick transition from the stationary state to moving. We can say that such a movement comes from Ki(ch'i). To reach such a level, of course, it takes time, even a decade. Ki(ch'i) can be generated and released from the inside of the body. Therefore, Ki(ch'i) cannot be materialized by reading books or by just imitating Mr. Sawai's movement. Master Wang mentioned that although there were many styles of Chinese kung-fu, there should be a few patterns to defend oneself against a sudden attack of an opponent. Against the attack, a full-fledged athlete should react naturally, protecting himself and attacking an opponent by using such patterns without any intention. These sophisticated movements should be called "the martial art". Master Wang studied hard other Chinese kung-fu, including White Crane kung-fu、Shaolin kung-fu and so on. He abstracted essences from them, and then removed indigenous forms from each of these Chinese kung-fu's. He analyzed such essences, purified essences to several simplified basic movements and then mastered them. During sparring, while he changed his seeming forms in accordance with the movement of an opponent, he always maintained the simplified essential movements. That is the reason why his style, YIQUAN, has no specific, fixed form for fighting. Herein, please allow me, the writer, to introduce my experiences: I had trained Chinese martial arts other than Taiki-ken before. Their training method was to repeat same fixed fighting patterns over and over again. While I became bored of such training, I questioned if I could move as in training when an opponent attacked on me. Wolud an opponent move as I desired and as in training? Could I be flexible enough to adjust to the changing of an opponent's movements? When I heard that Taiki-ken does not have a fixed form for fighting and is flexible to adjust to any movements of opponents, I decided to learn Taiki-ken. In addition to the name of YIQUAN, the martial art developed by Master Wang is called DACHENGQUAN which means that all Chinese martial art styles are compiled into one style. Therefore, DACHENGQUAN reflects essential characters of Chinese kung-fu like 1)to move naturally, circling against an opponent, 2)to fight at your own best-balanced position, seeking best timing for attacking without excessive power, 3)to release the inside body power from wherever one wants (ex. a hand, a leg or others) and 4)to use the palms for punching (open-handed attack), not the hardly clenched fists. On the other hand, if we could explain Taiki-ken by simple words, Taiki-ken is the revolutionary martial art without conventional fixed forms, putting priority on Ki(ch'i) or imaging. "Ritsuzen", "Yuri" and "Hai" are the major three practices of Taiki-ken. "Ritsuzen", through which Ki(ch'i) is developed together with training for the legs and the waist, is just standing-up and seeking the center of the body. This "Ristuzen" is the practice for the stable state. Next to "Ritsuzen", we transit to the training of "Turi". This stage is transition from the stable state to the moving state. And then, the training of "Hai" starts, which is the moving state. Through "Hai", we develop the method of walking for fighting called "Hohou" together with training for the legs and the waist. Next, we practice actual techniques for fighting, called "Neri". "Neri" is categorized by four kinds of techniques like "Daken", "Haraite", "Sashite" and "Mukaete". Through training of Neri, we learn how to protect and attack, efficiently utilizing the power of an opponent. who was once considered by Mr. Masutatsu Oyama the strongest foreign karate-man in Kyokushin karate. After returning from the Netherlands, he joined Sawai's school. Through many matches with martial artists from other outside schools, under Sawai, he became the head of "renshi" at the 2nd golden age of Mr. Sawai's school. Furthermore, in accordance with Sawai's recommendation, he was instructed under Mr. Norimasa Iwama, who was one of the top students at the 1st golden age of Mr. Sawai's school, for 2 years. After the death of Sawai, he learned YIQUAN from Master Yao Chengguang and Master Yao Chengrong, sons of Master Yao Zongxun who was the formal successor of YIQUAN, several times. -Technical adviser and honorary director of Zhongyi Wuguan in Peking which is being operated by the director Master Yao Chengrong. Putting the priority on the real fighting, Taiki-ken has been explained that it would be hard to master for beginners and middle-grade martial artists. However, I am instructing Taiki-ken in the Shisei-jyuku systematically from the basic principles to their application in fighting so that even beginners could understand. I am recommending Taiki-ken to those who are seeking for the real strength. Though we often hear that Taiki-ken is hard to master, Taiki-ken is being instructed in Shisei-jyuku to master surely and systematically to not only those who have experiences of other martial arts but also beginners. Frankly speaking, whenever I read books about Chinese kung-fu, I find that some explanations about its principles are difficult to understand. (Almost impossible to understand.) In Shisei-jyuku, Takagi sensei simplifies such explanations and explains essential points together with his demonstrations. Hearing and seeing Takagi sensei, I duly understand what the descriptions mean, which was a wonderful surprise to me. 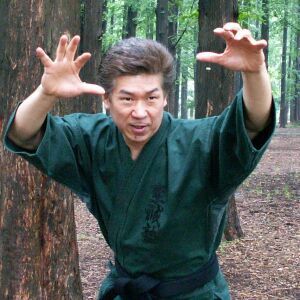 I heard that even sport writers, who interviewed Takagi sensei, were surprised by his plain explanation about (seemingly) difficult principles of Chinese kung-fu. I consider that one of the advantages of learning in Shisei-jyuku. Also, though Taiki-ken is famous for the rampant sparring based on its real fighting style, which has no restriction on attacks to the face and uses no protector to be used, Taiki-ken Shisei-jyuku, as the basic policy, prohibits students from sparring in one year to three years from joining. Takagi sensei reiterates that to spars without basic techniques of Taiki-ken, makes one's performance poorer. Sparring under the conditions of Taiki-ken's style, with no protector and free attackes to a face, is dangerous, and also horrible to those who are not accustomed to this style. Takagi sensei says: "One reason that a player is so horrified and withered during a sparring is that he doesn't know how to protect himself." I estimate a year to three years to master techniques to protect oneself from any attack of an opponent. Without the techniques for protection, students cannot get any benefits form Taiki-ken's sparring." Also, if you have certain experience of other martial arts and have the aim to master Taiki-ken's movements efficiently, we recommend not to spar for one year to three years. Without sufficient techniques of Taiki-ken, your techniques in sparrings would depend on those of other martial arts you already mastered. In this case, Taiki-ken's techniques you are practicing would not be used, which means that the practice of Taiki-ken until then is faded. Mr. Sawai and Mr. Iwama also mentioned: "The real techniques are generated when your body removes all seeming techniques you learned previously." Herein, you don't have to worry about the removal of previously learned techniques. The techniques they mentioned seem like real techniques. Please consider this; your accumulated basic techniques are newly systematized and enhanced under Taiki-ken's system. Therefore, your ability of other martial arts is also improved dramatically after mastering Taiki-ken. That's the reason why there are many students in Taiki-ken who are instructors or full-fledged athletes of other martial arts. They are trying to perfect their own style by learning Taiki-ken. This is also one of the unique characteristics of Taiki-ken. In case of the shisei-jyuku, there are many students who have sufficient experiences of other martial arts, even at instructors' level. It seems to me, the writer, that such people intentionally chose not to spar in shisei-jyuku for a few years. At the classes in Shisei-jyuku, we first make training for finding the center of own body through intensive "Ritsuzen" training. 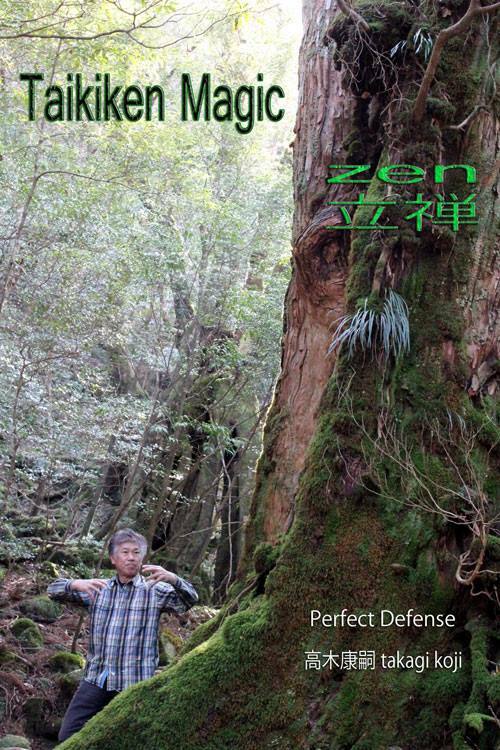 Being conscious of this center, we practice the movement of Taiki-ken, and then learn how to protect ourselves. Also, through "Suishu", which is similar to sparring (but not violent), we can simulate our own movements against attacks from an opponent. However, Shisei-jyuku does not deny sparring completely. Shisei-jyuku has a class for practice of sparring once a month, and a training camp once a year. Participants in such classes who have already mastered the basic techniques of both protection and attacks under the Taiki-ken style tell that they can enjoy sparring like a psychological game because they are able to read the next movement of an opponent from a tiny signal from his body. In Shisei-jyuku, there are a large variety of students ranging from instructors of other martial arts to beginners to ladies. All these people are being instructed to master Taiki-ken firmly. Also, though it is popular in many martial art's schools that an apprentice instructs students, in Shisei-jyuku, Takagi sensei himself is making direct instruction to students, demonstrating various movements taken over from Master Sawai. We are sorry that we do not accept visitors to see practice. Takagi sensei said, "By watching Taiki-ken for just a short time, I hardly believe that people can see what Taiki-ken is. It takes at least 6 months to understand the correct acknowledgment of Taiki-ken (but, probably, it would be obscure). Therefore, once you start to practice, without any suspicion, I recommend to continue practice at least 6 months." Personally, the writer does not deny that the style of Taiki-ken can be acceptable or not partly depends on people's personality. However, according to my survey of the students of Shisei-jyuku, almost all the students who practice for over 6 months understood the concept of Taiki-ken, and are so immersed as to participate in the classes three times per week. Upon receipt of it, we will respond to you. Also, Takagi sensei will interview a prospective before they enter. (Don't be so serious. It's just a frank discussion.) If you have any concern about practising Taiki-ken in Shisei-jyuku, you can ask it to Takagi sensei at the interview. I would like to explain the atmosphere of Shisei-jyuku about which you might be concerned. Shisei-jyuku is covered by a cheerful and positive atmosphere in not only regular classes but also training camp. We welcome beginners, ladies and seniors, and of course, we'll welcome the person from another countries(now we have English man and an Australian). Currently, there are several ladies and a few 50's in practice. Because Taiki-ken, namely YIQUAN, had a tremendous impact on qigong, it is good for the health, releasing mental stress, making for moderate exercise. Although it's said that "Ritsusen" training is hard, it will be comfortable when you are accustomed to do it after mastering the proper way. Frankly speaking, before starting Taiki-ken in Shisei-jyuku, I went to acupuncture or chiropractic every week. Now, it is once a month or less. As Taiki-ken can be exercised for life, keeping your own pace of training, I recommend Taiki-ken to those who are interested, even over 30's. -The training camp is held in autumn. In the camp, we practice "Ritsuzen" in the bosom of Mother Nature, and sparring if you want. Even beginners can participate in this class. No special background like skills are required. The above events can be used for your incentive to continuing the Taiki-ken especially when you are tired or loose the initial eagerness. In everything, it is difficult to continue. Continuation brings power. Upon receipt of it, we will respond to you. These books and videos are recommended if you want to know on Taiki-ken. But we are sorry we don't deal in these materials. This is about Sawai sensei and his ideas/philosophy of Taiki-ken. A lot of martial artists in Japan seem to think highly of this book. This book, written by Sawai sensei, includes a lot of pictures which shows techiques of Taiki-ken. If you don't get English version "The essence of Kung-fu: Taiki-ken"(because this is out of print), you cannot help getting this Japanese original book.